The Company’s Board of Directors, a joint committee, is composed by 11 members, three of them are independent members, with two-year combined term of office, and re-election is authorized. In line with the best corporate governance practices, the positions of Chief Executive Officer and Chairman of the Board of Directors are held by different persons. The Board of Directors has its own charter, whose wording in effect was approved at the Board of Directors meeting held on June 26, 2015. The responsibilities of the Company’s Board of Directors, besides those defined by Article 142 of Law n.º 6.404 of September 15, 1976 (“LSA”), are provided for in Article 19 of the Company’s Bylaws and in Article 5 of the Company’s Board of Directors Charter. The Board of Directors yearly is submitted to a formal performance evaluation, as a joint committee and individually (“Self-evaluation”), in compliance with the good corporate governance practices and pursuing the body’s continued improvement. In addition, the Company’s senior management (members of the Board of Directors and Board of Executive Officers) is submitted to an external periodic evaluation (“External Evaluation”), led by an external consulting firm. Up to date, two External Evaluations (2010 and 2014) and five Self-evaluations (2011, 2012, 2013, 2014 and 2015) were implemented. The Corporate Governance Department is liable for conducting the Self-evaluation, with participation and directions of the Corporate Governance Committee Coordinator , as well as for the consolidation of answers and feedbacks received in the Self-evaluation, fully treated confidentially. Only the Corporate Governance Department has access to the individual answers, whose consolidated results are subsequently discussed within the scope of the Corporate Governance Committee and the Board of Directors. Yearly, the Corporate Governance Department sends the Self-evaluation questionnaire to members of the Board of Directors, whose objective is to evaluate the performance of the Board of Directors in its several aspects in order to identify the high performance area and those deserving the development of action plans for a continued improvement of the works developed by the joint committee and by the Company’s executive areas. The Questionnaire has 55 questions, evaluated by board members within a scale from 1 to 5, divided into 5 dimensions: (1) strategic focus of the Board; (2) understanding and information on business; (3) independence and decision-making process of the Board; (4) operation of meetings and committees of the Board; (5) motivation and alignment of interests. The consolidated scoring obtained in each question allows to determine eventual differences in relation to the good governance practices and the opinion of board members as to ideal situation. From final report, the Corporate Governance Committee discusses the Self-evaluation results and the opportunities of improvement identified to develop the action plans, aiming the continued evolution of the Company’s Corporate Governance, as well as its preservation and optimization. Subsequently, the recommendations of the Corporate Governance Committee are submitted to the Board of Directors, which are approved and prioritized for implementation. The External Consulting is liable to conduct the External Evaluation, with directions of the Corporate Governance Committee Coordinator and the Corporate Governance Department for drawing up the final report, whose results are subsequently discussed within the scope of the Corporate Governance Committee. The External Evaluation methodology consists of: (a) individual interviews with members of the Board of Directors and Board of Executive Officers to understand the Company’s current context; (b) individual interviews with each board member for a joint evaluation and of other board members; (c) online questionnaire applied to members of the Board of Directors and Board of Executive Officers (d) consolidation and formulation of final recommendations with individual and joint feedback, and indicating the need of adjustments and/or improvement. The final report includes the conclusions of current corporate governance process and practices, as well as the internal opinions on opportunities of improvement, as well as recommendations of the External Consulting on the Company’s governance models and its practices. From the Annual Report, the Corporate Governance Committee discusses the results of the External Evaluation and the opportunities of improvement identified to develop the action plans. Subsequently, the recommendations of the Corporate Governance Committee and the Final Report of the External Consulting are discussed at the Board of Executive Officers meeting, and accordingly, submitted to the Board of Directors for discussion of results and approval of improvement actions to be implemented. Member of the Board of Directors of Cielo S.A. (member since August 30, 2017). Solid professional experience in the financial and means of payment sector. Mr. Favarão holds a degree in business management with MBA in Capital Markets from IBMEC/SP, MBA in Business Management from INSPER, MBA in Retail Business: Strategy and Management from FIA – Management Institute Foundation and AMP –Advanced Management Program from ISE Business School /SP. Mr. Favarão initiated his career at Banco Excel S/A in 1992 and remained at the bank until September 1995. From September 1995 to November 2003, he worked at the banks Pontual S/A and Zogbi S/A acting in the area liable for business relationship with medium and large-sized companies, more specifically related to the management of loan and funding operations. Between 2002 and 2003, Vinícius worked at the financial institution Banco Zogbi S/A, as Commercial Officer Assistant, in charge of structuring partnerships with retailers for origination of consumer direct credit operations. In November 2003, Banco Bradesco S/A acquired Banco Zogbi S/A and as of that date, he worked at Finasa Promotora de Vendas as Executive Controller, head of consumer direct credit operations with large-sized retailers. In July 2006 and with Banco Bradesco S/A’s acquisition of American Express’ Brazilian operations, Vinícius then oversaw American Express’ Merchants Network in Brazil. In August 2010, he cumulated the responsibility for managing the product portfolio for individuals and legal entities of American Express, when he was nominated officer at the conglomerate of Banco Bradesco S/A Cards. Mr. Favarão was also the head of product portfolio of Visa, Mastercard and Elo cards. In July 2013, he was nominated Officer at Banco Bradesco Financiamentos S/A, unit in charge of payroll-deductible loans for retirees, pensioners and public servants, remaining at this position until February 2017, when he was nominated officer at Banco Bradesco Cartões. Member of Cielo S.A.’s Board of Directors (member since Feberuary 25, 2019). Mr. Carlos Motta dos Santos holds a degree in administration with an MBA in business management. At Banco do Brasil since 1986, Mr. Motta held several positions, amongst them, general manager of Individuals, Corporate and Agricultural Business Unit, Bahia State retail controller, executive manager of the Strategy & Organization Executive Board, and Southeast Distribution Executive Board. Currently, Mr. Carlos Motta is the Retail Distribution Vice President at Banco do Brasil S.A.
*The board member elected herein only shall be vested in office after his election is approved by the Brazilian Central Bank. Independent Member of the Board of Directors (member since June 1, 2009) and coordinator of the Corporate Governance and Sustainability Committees of Cielo S.A. Solid professional experience in corporate governance and capital markets. He holds a degree in Law from Universidade do Estado do Rio de Janeiro – UERJ (1972) and an Executive MBA from COPPEAD, Universidade Federal do Rio de Janeiro – UFRJ (1987). He began his professional career as an attorney at the Brazilian Development Bank – BNDES in 1974 through civil-service examination. During his career as attorney at BNDES, he held several positions, amongst them we point out BNDESPAR’s Legal Superintendent. He also served as officer at the BNDES, as Controller of Financial and International, Capital Markets and Administrative Areas. He was also Officer at BNDESPAR and BNDES. During such period, he was a member of the Boards of Directors of Fundação de Assistência e Previdência Social do BNDES – FAPES (Welfare and Social Security Foundation) and the Rio de Janeiro Stock Exchange. After serving one year and a half as Officer of the Brazilian Securities and Exchange Commission – CVM, he was nominated President of the Comission in August 1995, position he held until the end of January 2000. During such period he joined the COMOC – Comissão da Moeda e do Crédito (Currency and Credit Commission), an advisory body of the Brazilian Monetary Council and the Supplementary Private Pension Management Council; he also presided the Council of Securities Regulators of the Americas – COSRA and joined the Executive Committee of the International Organization of Securities Commissions – IOSCO, organizations which gather regionally and internationally the securities and exchange commissions all over the world. He was also a member of the Boards of Directors of several companies amongst them, Banco do Brasil S.A. (between 2001 and 2009) and Vale S.A (between 2007 and 2010). In the academic field, he was Commercial Law Professor at Faculdade de Direito UERJ, Faculdade de Direito Cândido Mendes and Instituto de Direito Público e Ciência Política from FGV-Fundação Getúlio Vargas. He is also lecturer and speaker at conferences in several other entities. Currently, besides working as an attorney and partner of the law firm Bocater, Camargo e Costa e Silva Advogados, he is a member of the Development Council of the Pontifical Catholic University of Rio de Janeiro – PUC-Rio, and a member of the Advisory Council of COPPEAD. He is also a member of the Board of Directors of Usiminas S.A., a member of CAM – Market Arbitration Panel linked to BM&FBovespa and a member of the Securities Analyst Oversight Council of APIMEC. An independent member of the Board of Directors of Cielo S.A. (member since April 30, 2010), coordinator of the Audit, Finance, People Committees and ad hoc member of the Corporate Governance of Cielo S.A.. Solid professional experience in the financial and technology markets. He holds a degree in the Escola de Administração de Empresas de São Paulo of FGV – Fundação Getúlio Vargas in 1972. Between 2005 and 2012, he was a board member, Vice Chairman and Chairman of the Board of Directors of IBGC – Brazilian Institute of Corporate Governance. Between 1994 and 2008, he served as managing officer at BOVESPA – São Paulo Stock Exchange and CBLC – Cia Brasileira de Liquidação e Custódia (Brazilian Company of Settlement and Custody). During such period, he was responsible, among other things, for the creation of Novo Mercado, the integration of the Brazilian stock exchanges, demutualization and IPO of BOVESPA itself. Then, he negotiated the merger of Bovespa and BM&F when he was elected the first chairman of BM&FBOVESPA S/A – Securities, Commodities and Futures Exchange. Internationally, for nearly eight years, he was a member of the executive committees of WFE – World Confederation of Exchanges and FIAB – Ibero-American Federation of Stock Exchanges. From 1971 to 1994, he was executive and officer of banks and financial companies (Francês e Italiano; Serasa; Noroeste; Comércio e Indústria; Geral do Comercio; Sudameris) in the areas of credit, planning, information technology, marketing and products. Solid performance as a member of the audit, risk and finance committees of several companies. Since 2009 he has been serving as an advisory member of PRAGMA Gestão de Patrimônio Ltda. and external consultant of the Audit, Risk Management and Finance Committee of Natura S.A.. Since 2011 he has been serving as an independent member of the Audit Committee of TOTVS S.A.; since 2013 as fiscal council member of Natura Institute, Arapyaú Education and Sustainable Development Institute and RAPS – Rede de Ação Política pela Sustentabilidade (Network of Political Action for Sustainability); and since 2014, as an independent board member of Âmbar S/A. Member of the Board of Directors of Cielo S.A. (member since February 07, 2019). Mr. Carlos Hamilton Vasconcelos Araújo holds a degree in Civil Engineering from the Federal University of Ceará-UFC with a master’s degree and Ph.D. in Economics from Postgraduate School of Economics of Getúlio Vargas Foundation – EPGE/FGV. During his professional career, he served as vice chief executive officer of services, infrastructure, and operations, a member of the Risk and Capital Committee of Banco do Brasil, a member of the Board of Directors of BB Seguridade Participações S.A., Rio Minas Energia Participações S.A and Neonergia S.A, planning and strategy officer at Eldorado Brasil Celulose S.A., Economic Policy Officer, International Affairs Officer, deputy head and advisor at the Brazilian Central Bank’s Studies and Research Department. Vice-Chairman of the Board of Directors of Cielo S.A.(member since January 26, 2017). Vast professional experience in the financial, insurance and retail areas. Mr. Labuto holds a degree in Management from UNB (University of Brasília) and in Information Systems Management from UNEB (Educational Union of Brasília), with an MBA in Marketing, from COPPEAD UFRJ (Institute of Management Graduate Studies and Research of the Federal University of Rio de Janeiro). Career civil servant at Banco do Brasil, he has been acting as Retail Business Vice President at Banco do Brasil since 2016. Previously, Mr. Labuto was the Chief Executive Officer of BB Seguridade Participações S.A.; Insurance, Open Pension Plan and Savings Bonds Officer (March 2013 to April 2015); Loans and Financing Officer (February 2012 to March 2013); General Manager at the Affiliated Entities Governance Unit (November 2011 to February 2012) and General Manager at the Strategic Partnerships Unit (August 2011 to November 2011) at Banco do Brasil. Mr. Labuto is a sitting member of the boards of directors of BB Seguridade Participações S.A.; Brasilcap Capitalização S.A.; IRB Brasil Resseguros; Elo Participações S.A.; Companhia Brasileira de Soluções e Serviços; BB Mapfre SH1 Participações S.A.; Mapfre BB SH2 Participações S.A.; Brasilprev Seguros e Previdência S.A., where he also acts as member of the Advisory Committee and member of the Executive Committee of BB Insurance Group and Mapfre. Chairman of the Board of Directors of Cielo S.A. (member since April 20, 2012). Solid professional experience in the financial markets, especially cards, means of payment and payment processing. He holds a degree in Business Administration from UFPE – Universidade Federal de Pernambuco with specialization in Finance from the IBMEC – Instituto Brasileiro de Mercado de Capitais and Advanced Management Program (AMP) of the Instituto de Estudios Empresariales (IESE) – Business School – University of Navarra, in Barcelona. He started his career at Banorte. From July 1996, he joined Banco Alvorada S.A., former Banco Bilbao Vizcaya Argentaria Brasil S.A., as commercial officer, reaching the position of vice president of products, trade finance, middle market and retail. In February 2004, he was elected Departmental Officer at Banco Bradesco S.A. In December 2010, he was elected Deputy Executive Officer and in January 2012, Executive Managing Officer. Currently, he is Vice-President of Banco Bradesco S.A., and officer in several companies of Bradesco Group. He is a member of Fundação Bradesco’s Managing Body and a member of the Board of Directors of FIMADEN – Fundação Instituto de Moléstias do Aparelho Digestivo e da Nutrição (Foundation Institute for Digestive System and Nutrition Diseases). He is also the Chief Executive Officer of ABECS – Associação Brasileira das Empresas de Cartões de Crédito (Brazilian Association of Credit Card Companies) and a member of the Latin America and Caribbean Advisory Council of Visa International and chairman of the Board of Directors of MPO – Processadora de Pagamentos Móveis S.A.; Vice Chairman of the Board of Directors of CBSS – Companhia Brasileira de Soluções e Serviços; a member of the Board of Directors of BBD Participações S.A., Cidade de Deus – Companhia Comercial de Participações and Elo Participações S.A. Independent member of Cielo S.A.’s board of directors (member since February 1, 2018) and member of the Finance and Sustainability Committees. Solid professional experience in the financial market. Ph.D. in Economics from the University of São Paulo in 1996. Bachelor and Master degrees in Economics from University of Brasília (UnB). Ph.D. in Economics from University of São Paulo (USP). Mr. Mendes worked 29 years and a half at Banco do Brasil. Main duties included: International Finance Manager, Market Risk Management Controller, Chief Financial Officer, Capital Markets Officer, Vice Chief Financial, Capital Markets and Investor Relations Officer (2005-2009). Chief Executive Officer at Cia de Seguros Aliança do Brasil (June to December 2009), Monetary Policy Officer at Brazilian Central Bank (December 2009 to July 2016), Executive Officer at Banco Original S.A. (January to December 2017). Positions held in councils and joint committees: Member of BM&F’s board of directors (January 2003 to December 2006), Member of Previ’s decision-making council (March 2003 to June 2008 – he has been acting as chairman since August 2004). Mr. Mendes was a board member of the following companies: CSN – Companhia Siderúrgica Nacional (March 1999 to March 2000), RGE – Rio Grande Energia (March 2002 to March 2004), TNL – Telemar Norte Leste – current Oi (March 2004 to July 2005), Neoenergia S.A. (August 2005 to March 2006), Visanet – current Cielo (April 2006 to September 2009), CIP – Payment Interbank Center (March 2007 to March 2009), BB Tecnologia e Serviços (May 2008 to April 2009). Member of the Board of Directors of Cielo S.A. (member since April 14, 2015). Vast professional experience in structuring of financial operations and corporate governance areas. He holds a degree in Economics with specialization in Business Administration from Fundação Getúlio Vargas in São Paulo and an MBA in International Business from FIPECAFI-USP. He developed his career at Banco do Brasil, serving as Means of Payment Officer since February 2015. Formerly he was General Manager of UGE – Governance Unit of Affiliated Entities and Large Corporate Controller. He also served as Structured Operations Executive Manager of Commercial Executive Board between 2008 and 2011. He is a sitting member of the Board of Directors of Elo Participações S.A., Companhia Brasileira de Soluções e Serviços, Elo Serviços S.A., Cateno Gestão de Contas e Pagamentos S.A., Stelo S.A. and of the Advisory Board of BBTurismo. Member of the Board of Directors of Cielo S.A. (member since March 22, 2018). Statutory Officer at Bradesco Cartões, in charge of finance areas of the Cards Department since 2009. Mr. Terra also served at Banco Ibi S.A., from 2005 to 2009, as a controller, in charge of the regulatory information and services to the Brazilian Central Bank (indirect inspection). Between 2008 and 2009, Mr. Terra was Controllership and Financial Planning Officer. He also served at Banco Citibank for 17 years, acting in the areas of credit control, market risk credit control (treasury), companies regional division (except São Paulo), financial controllership, inclusive as officer assistant. Francisco Terra is graduated in Economic Sciences from the Pontifical Catholic University of São Paulo. Member of the Board of Directors of Cielo S.A. (member since January 28, 2019). Mr. Omuro holds a degree in Business Administration from Pontifical Catholic University of Campinas – PUC, an MBA with emphasis in Marketing from Getúlio Vargas Foundation – FVG, an MBA with emphasis in Banking from FIA – USP and Specialization in Advanced Management from AMP ADV Management – University of Navarra, Mr. Omuro is an employee of Banco Bradesco S/A, he has over 37-year experience of a career initiated in 1981 in a bank branch, Mr. Omuro held several positions until General Manager, subsequently working in different areas as Retail Management, Low and High Income Management Executive Controller, currently he serves as Bradesco Cartões Commercial Officer, in charge of distributing the products and services of Banco Bradesco and investees to all Individuals and Corporate segments. * As defined by IBGC (Brazilian Institute of Corporate Governance)’s Code of Best Corporate Governance Practices, the external Board member has no current business relationship, whether as employee or executive at the company, but who are not independent, such as former officers and former employees, attorneys and consultants providing services to the company, partners or employees of the controlling group, subsidiaries or companies of same economic group, relatives and asset managers with relevant interest. **Pursuant to the “Novo Mercado” Listing Rules, the independent Board member : (i) does not have any relationship with the Company, except for equity interest; (ii) is not a Controlling Shareholder, spouse or relative up to second degree thereof, over the past three (3) years is not or has not been bound to a company or entity related to Controlling Shareholder (persons bound to public educational and/or research institutions are excluded from such restriction); (iii) over the past three (3) years, is or has not been employee or officer of the Company, Controlling Shareholder or entity controlled by the Company; (iv) is not direct or indirect supplier or buyer of services and/or products of the Company, in magnitude to imply loss of independence; (v) is not employee or manager of the company or entity offering or requesting services and/or products to the Company, in magnitude to imply loss of independence; (vi) is not a spouse or relative up to second degree of any manager of the Company; and (vii) does not receive another remuneration from the Company besides that one referring to the position of Board member (cash dividends deriving from equity interest are excluded from such restriction). The Corporate Governance Committee Coordinator is also an independent member of the Company’s Board of Directors. 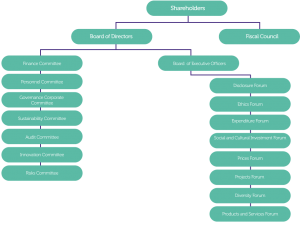 Pursuant to the “Novo Mercado” Listing Rules, the independent Board member : (i) does not have any relationship with the Company, except for equity interest; (ii) is not a Controlling Shareholder, spouse or relative up to second degree thereof, over the past three (3) years is not or has not been bound to a company or entity related to Controlling Shareholder (persons bound to public educational and/or research institutions are excluded from such restriction); (iii) over the past three (3) years, is or has not been employee or officer of the Company, Controlling Shareholder or entity controlled by the Company; (iv) is not direct or indirect supplier or buyer of services and/or products of the Company, in magnitude to imply loss of independence; (v) is not employee or manager of the company or entity offering or requesting services and/or products to the Company, in magnitude to imply loss of independence; (vi) is not a spouse or relative up to second degree of any manager of the Company; and (vii) does not receive another remuneration from the Company besides that one referring to the position of Board member (cash dividends deriving from equity interest are excluded from such restriction). The Company’s Bylaws provide for eventual installation of a Fiscal Council, an independent surveillance body of the Board of Executive Officers and of the Board of Directors, which is not permanent, with duties and powers conferred by law. Since it is not permanent, the Company’s Fiscal Council may be installed by a General Meeting upon shareholders’ request, in the assumptions provided for by law. Currently, the Company has a Fiscal Council installed at the Annual and Extraordinary General Meetings held on April 8, 2016, the charter of which was approved at the Annual and Extraordinary General Meetings held on April 13, 2009. The Fiscal Council responsibilities are provided in Chapter II of the Fiscal Council’s Charter, namely: (i) perform the duties provided for by Law nº. 6.404/76 and Article 25 of the Company’s Bylaws; (ii) any of its members will oversee the acts of Management and verify the compliance with their legal and statutory duties; (iii) give an opinion on the Management’s annual report, including in its report the additional information it deems necessary or useful for resolution at the general meeting; (iv) give an opinion on the Management bodies proposals to be submitted to the general meeting, referring to (a) change in the capital stock, (b) issue of debentures or warrants, (c) Capex plans or capital budget, (d) distribution of dividends, (e) transformation, (f) incorporation, merger or spin-off; (v) any of its members will denounce to the Management bodies and, if the latter does not take the measures necessary to protect the Company’s interests, denounce to the general meeting, the errors, frauds or crimes they found out and suggest useful measures to the Company; (vi) call for the annual general meeting, if Management bodies delay for another one (1) month such call, and the extraordinary general meeting, whenever serious or urgent reasons occur, including in the agenda of the meetings the matters it deems necessary; (vii) to analyze, at least, quarterly, the trial balance sheet and other financial statements periodically drawn up by the Company; (viii) analyze the financial statements for the fiscal year and provide an opinion thereon; (ix) perform the duties described in items above during the Company’s liquidation, in view of special provisions regulating them. The Board of Executive Officers is composed of, at least, two (2) and at most, ten (10) members, being one (1) Chief Executive Officer, one (1) Investor Relations Officer and up to eight (8) Officers without specific designation, elected by the Board of Directors, with two-(2) year term of office, and reelection is authorized, pursuant to its Charter. The Officers may accumulate positions, according to deliberation of the Board of Directors. The Company currently has eight (8) Executive Officers, being one CEO, one Investor Relations Officer and five Officers without specific designation. The Board of Executive Officers is composed of 8 statutory officers. Graduated in Law, with an MBA in Corporate Law and Finance from Getúlio Vargas Foundation (FGV), with specialization in Foreign Trade from Business School FAE/CDE Curitiba and International Trade Law from IBEJ (Brazilian Institute of Legal Studies) Curitiba, besides a master’s degree in Business Management & Economics from UNB (University of Brasília). He held the position of Banco do Brasil’s Chief Executive Officer until October 2018. Mr. Caffarelli also served as executive officer at Companhia Siderúrgica Nacional – CSN in 2015, cumulating the duties of Investor Relations Officer in 2016. Between 2014 and 2015, he acted as executive secretary at the Ministry of Finance. He initiated his professional career at Banco do Brasil where he worked for over 30 years holding several positions at Banco do Brasil’s executive board. Mr. Caffarelli held the positions of vice president of Cards and New Retail Business and vice president of Wholesale Business, International Business, and Private Bank. He also served as officer at the executive boards of Distribution, Logistics, Marketing & Communication, and New Retail Business. Chief Financial Officer since March of 2019. Graduated in Business Administration from the Federal University of Rio Grande do Norte and an MBA from Columbia Business School, a Master in Business Economics Management from the University of Brasilia, an MBA in Financial Administration from Fundação Getúlio Vargas. Mr. Gustavo Sousa has held several noticeable positions in large Brazilian companies, having last served as Chief Financial Officer and Investor Relations Officer of Klabin. In addition to Klabin, Mr. Gustavo Sousa was the Chief Financial and Investor Relations Officer of CPFL Renováveis, Controlling, Treasury, Investor Relations and Tax Executive Director of Companhia Siderurgica Nacional and Controller and General Manager of Investors Relations of Banco do Brasil. *The Director elected herein only shall be vested in office after his election is approved by the Brazilian Central Bank. Executive Vice President of Operations and Customer Service since March 2019. Graduated in Information Technology from FATEC- SP, with graduate studies in Administration and Internet Technology.During his 33 years of experience, Mr. Kinoshita held relevant positions in banks, telecom, industrial, retail, call center and insurance companies, with broad expertise in Business Unit, Customer Service and Information Technology (IT). During his career, he held several positions in companies, such as LATAM Broadband Business Unit and Customer Care VP at LATAM AT&T/SKY (since 2014), Customer Operations VP at Global Village Telecom, Contact Center, IT and Operations Officer at SulAmérica Seguros and IT Officer at Grupo Abril. Executive Vice President of Commercial Large Accounts since January 2015. Graduated in Economics from PUC/SP, and an Executive MBA in Marketing from IBMEC, with an International Extension at the University of California – Irvine. She has over 20 years of experience in the financial services industry, working in several companies such as Credicard, Banco ABN AMRO S.A., Banco Lloyds TSB S.A., Visa, Contax and Cielo. Executive Vice President of Products and Business, which envisages Products and Innovation areas, Strategic Planning and M&A, and Marketing since July 2016. Graduated in Business Management on IBMEC and post-graduated in Strategy, M&A, Product and customer management, Credit management, High performance team management and development. Before working for the Company, he was consultant at Roland Berger Strategy Consultants. Executive Vice President of Organizational Development since August 2017. Graduated in Business Administration from University Center of Brasília – UniCEUB, and an MBA in Business Administration and Finance from Brazilian Institute of Capital Markets (IBMEC), the COPPEAD Graduate School of Business and Getúlio Vargas Foundation (FGV). Mr. Pontes also holds specializations in Managers Development Program from Duke University’s Fuqua School of Business and in Leadership for Executives and Competitive Strategy and Owners and President Management Course (OPM), both from Harvard Business School. Mr. Pontes has more than 20 years of experience in management of corporate departments, operating in the most diverse areas, such as Strategy, Controllership, Supplies, Human Resources and Financial, remaining ahead of operations in Brazil, Peru and China, country which he lived for five (5) years. He joined the Company in April of the same year as Executive Officer of Organizational Development. Executive Vice President of Technology Project Officer since May 2018. Graduated in Computer Engineering from Federal University of São Carlos, with graduate studies in Business Administration from Mauá Technology Institute, International Executive MBA from FIA (Administration Institute Foundation). Mr. Zimmermmann cumulates more than 16 years of executive positions in the payment industry; he worked in Brazilian and multinational companies. Mr. Zimmermann has experience in technology, operations, project and product areas, he led startups and managed large operations wherein technology composed the core business. Before joining Cielo, Mr. Zimmermmann held leadership positions in companies, such as Alelo, Qualicorp, Global Payments, Redecard, and Orbitall. Risk Executive Officer since January 2019. Mr. Toniolo holds a degree in Business Administration with emphasis in systems, with graduate studies in Administration from EASP FGV/SP and a master’s degree in Computer Engineering from Technological Research Institute of the University of São Paulo (IPT/USP). Over the last three years, Mr. Toniolo worked as Compliance and Corporate Risk Statutory Officer at Paypal, previously he worked in other financial institutions, such as American Express, Itau-Unibanco, Safra, and HSBC. He joined the company in January 2019 to head the Corporate Risk, Compliance and Internal Controls area. The Company’s Bylaws accept the creation of technical and advisory committees, referred to as advisory committees or forums, which are supporting instruments to enhance the quality and efficiency of the Company’s Board of Directors performance, so that to maximize the Company’s value, and accordingly, for shareholders, always observing the principles and the best corporate governance practices. The installation of the Advisory Committees shall be incumbent upon the Board of Directors, only the Audit Committee is permanent. The Company currently has the following committees: (i) Audit Committee; (ii) Innovation Committee; (iii) Risks Committee; (iv) Finance Committee; (v) Corporate Governance Committee; (vi) Personnel Committee; (vii) Sustainability Committee. The Audit Committee, whose charter in effect was approved at the Board of Directors meeting held on June 19, 2013, is a permanent statutory body, which aims at advising the Board of Directors independently in relation to the Board of Executive Officers and other Company’s professionals. Pursuant to Paragraph 1, Article 27 of the Company’s Bylaws, it shall be incumbent upon the Committee: (i) to ensure the quality and entirety of the Company’s financial statements; (ii) ensure the compliance with legal and regulatory requirements; (iii) ensure the performance, independence and quality of works of the independent auditors and internal audit; (iv) discuss and monitor the audit plans and review the reports to be issued; (v) ensure the quality and effectiveness of internal control systems and the company’s risk management. It shall also be incumbent upon the Committee to issue recommendations and opinions so that the Board of Directors may promote the supervision and accountability of the Executive Board, and the Internal Audit area may regularly perform its duties, as the independent auditors may evaluate the activities practiced by the Executive Board and Internal Audit, pursuant to Chapter 2 of the Audit Committee’s Charter. The Innovation Committee’s ruling charter approved at the Board of Directors’ Meeting held on July 18, 2018, which is available at http://ri.cielo.com.br, aims at advising the Board of Directors in the analysis of initiatives relating to research, technological trends, and innovations, as well as policies, strategies and actions concerned with research and innovation within the scope of the Company. Pursuant to provisions in item 2.2 of the Company’s Innovation Committee’s Charter, it shall be incumbent upon the Committee to: (i) assess scenarios, business and technology trends, as well as their developments over the Company’s businesses; (ii) assess the Company’s projects, initiatives and investment proposals under the innovation viewpoint and formulate any recommendations to the Board of Directors; (iii) analyze and issue recommendations on the supplementary operational rules to operate this Committee, which shall be approved by the Board of Directors; (iv) analyze and issue recommendations on other issues requested by the Board of Directors. The Risk Committee, whose effective charter was approved at the Board of Directors’ meeting held on January 14, 2019, aims at advising the Board of Directors, focused on the quality and efficiency of risk management and minimum equity requirements applicable to the Company, ensuring its business purpose and values in conformity with the following basic corporate governance principles. In accordance with provisions of item 2.2 of the Company’s Risk Committee Charter, it shall be incumbent upon the Committee: (a) analyze and define its operational rules and submit them to the Board of Directors’ approval, which shall be compatible with the Company’s nature and complexity; (b) analyze and issue recommendations on the policies relating to risk management, business continuity, internal controls, compliance and minimum equity requirements applicable to payment institutions, as well as oversee compliance and guide the Company on the exceptions identified; (c) analyze and recommend, where applicable, proposals to revise the statement of risk appetite and tolerance, as well as risk management strategies, considering risk on an individual and integrated basis; (d) monitor the risk appetite levels set out in the statement of risk appetite and tolerance and its management strategies, considering risks on an individual and integrated basis, as well as the Board of Executive Officers’ compliance with these guidelines; (e) oversee the Officer’s performance to whom the responsibility for Risk Management, Internal Controls, and Compliance has been assigned; (f) analyze and monitor the works executed by internal and external audits relating to minimum equity requirements applicable to payment institutions and respective results; (g) analyze and issue recommendations, at least, yearly, on the stress test program, pursuant to prevailing laws, as well as the liquidity contingency plan to the Board of Directors; (h) analyze and issue recommendations, at least, yearly, on the equity adequacy plan to the Board of Directors; (i) use at its discretion, the work of experts on issues referring to this Committee’s competencies, without exempting from its responsibilities; (j) support the Board of Directors to promote and improve the risk culture; (k) position and report on a quarterly basis to the Board of Directors the evaluation of results relating to the risk management process, business continuity, internal controls, compliance and equity minimum requirements, as well as the level of adhesion of risk management structure to the applicable ruling instruments, enabling to the joint committee a broad and integrated overview of risk and its impacts; (l) comply with other responsibilities assigned by the Board of Directors, as long as these refer to the competencies outlined in this article. The Finance Committee, whose charter in effect was approved at the Board of Directors meeting held on August 31, 2016, aims at advising the Board of Directors focused on the quality and efficiency of activities performed by the Company related to its financial management and its economic and financial performance, so that to ensure that these activities are conducted to protect and value the Company, ensuring its corporate purposes. Pursuant to item 2.2 of the Company’s Finance Committee Charter, to sum up, it shall be incumbent upon the Committee, (i) to analyze and issue recommendations on the strategies, policies and practices adopted or to be adopted by the Company related to its performance area; (ii) to analyze, issue recommendations and monitor the Company’s annual plan of objectives and goals, the Company’s annual budget, as well as the financial statements and related information; (iii) to analyze and issue recommendations on investment and/or divestment proposals, loans and financing proposals and/or any funding operation and/or issue of credit instruments; (iv) to analyze, monitor and issue recommendations, where applicable, on the Company’s capital structure, indebtedness and cost; (v) to analyze and issue recommendations on the proposals for distribution of dividends and/or recording of capital reserves. The Corporate Governance Committee, whose charter in effect was approved at the Board of Directors meeting held on May 08, 2017, aims at advising the Board of Directors in order to ensure that the Company’s activities are conducted to protect and value the Company, by adopting the best corporate governance practices, ensuring the Company’s social objectives and values in conformity with the following basic corporate governance principles. Pursuant to item II of the Company’s Corporate Governance Committee Charter , it shall be incumbent upon the Committee, to sum up, (i) to recommend adjustments and evolvements in the Company’s corporate governance practices, whenever it deems necessary; (ii) to monitor the compliance with the guidelines set forth in the Code of Ethics, “Novo Mercado” Listing Rules, Disclosure Policy of Material Act or Fact and Preservation of Confidentiality, Securities Trading Policy, as well as other policies and documents under the Company’s responsibility; (iii) to monitor the Company’s governance policies, observing the level of governance adopted and ensuring the effective adoption of the best practices. It shall also be incumbent upon referred Committee to issue recommendations on potential conflict of interests between related parties whenever requested by the Board of Directors, or when it deems necessary. In this assumption, the Committee, exceptionally, shall be composed of, at least, two Independent Board members, and the second member shall be summoned to analyze the matter as ad hoc member of Committee, in replacement of Controlling Shareholders’ representatives. The Personnel Committee, whose charter in effect was approved at the Board of Directors meeting held on December 15, 2010, aims at advising the Board of Directors on the human resources strategies referring to the organizational development, planning and development of personnel, compensation and benefits of the Company’s employees and Management so that to align its practices with the market, aiming at attracting and retaining the best talents available in the market, as well as the continued development of the Company’s human resources. Pursuant to item II of the Company’s Personnel Committee Charter, it shall be incumbent upon the Committee, to sum up, (i) to monitor the personnel policies adopted by the Company and advise the Board of Directors on the strategies, criteria, compensation levels and benefits of its employees and Management; (ii) to advise on the criteria to grant call option or share subscription to Management and employees of the Company and its subsidiaries; (iii) to issue recommendations on the organizational and personnel development strategies and key position succession plans. The Sustainability Committee, whose charter in effect was approved at the Board of Directors meeting held on November 5, 2015, aims at advising the Board of Directors on the performance of its duties related to sustainability, set out guidelines and corporate actions and conciliate economic development issues with social responsibility issues, ensuring a successful business in the long term, contributing to a healthy environment, a fair society and Brazil’s social and economic development. Pursuant to item 2.2 of the Company’s Sustainability Committee Charter, it shall be incumbent upon the Committee, to sum up, (i) to propose and monitor the execution of projects which improve the Company’s sustainability profile in the social, environmental and economic dimensions; (ii) to propose the Company’s inclusion in domestic and international rankings referring to corporate sustainability; (iii) to monitor the social, economic and environmental commitments undertaken by the Company; (iv) to participate in the drawing up of social and sustainable development reports evidencing the Company’s social and environmental performance; (v) to oversee the Company’s social, environmental and economic indicators; (vi) to evaluate the results of social and cultural projects sponsored by the Company. The Disclosure Forum, whose charter in effect was approved at the Board of Executive Officers meeting held on December 8, 2014, aims at revising and approving information to be released to the market, also formalize the procedures to prepare information to be released to the market, in order to advise the Board of Executive Officers on the compliance with the Brazilian Corporation law (Law no. 6.404/76 and amendments), related rules in Brazil and US rules for registration and issue of stocks at the US stock exchanges. The Ethics Forum, whose charter in effect was approved at the Board of Executive Officers meeting held on December 8, 2014, aims at advising the Board of Executive Officers to promote the legitimation, respect, compliance and improvement of the Company’s Code of Ethics. The Expenditure Forum, whose charter in effect was approved at the Board of Executive Officers meeting held on December 8, 2014, aims at advising the Board of Executive Officers to ensure the best allocation of the Company’s resources, pursing the correct allocation for expenditures and investments, reinforce the efficient use of procurement processes implemented and the use of applicable normative instruments. The Social and Cultural Investment Forum, whose charter in effect was approved at the Board of Executive Officers meeting held on March 15, 2017, aims at analyzing and advising on the social projects, subject to the law of incentive or private budget, the Company’s sponsorships and donations, for the Board of Executive Officers’ resolution, as well as oversee its execution and the results achieved. The Prices Forum, whose charter in effect was approved at the Board of Executive Officers meeting held on December 8, 2014, aims at advising the Board of Executive Officers in relation to the Company’s products and services pricing, ensuring its corporate objectives, values, and compatible with basic corporate governance principles. The Projects Forum, whose charter in effect was approved at the Board of Executive Officers meeting held on December 8, 2014, aims at advising on the prioritization of strategic projects according to the short, medium and long-term goals, for the Board of Executive Officers’ resolution, as well as analyze the projects’ economic and systematic feasibility. The Diversity Forum aims at strategically discussing the relevance of the Company’s diversity, advising the Board of Executive Officers on the implementation of diversity-related measures. The Diversity Forum still does not have its own charter. The Products and Services Forum, the charter of which was approved at the Board of Executive Officers’ meeting held on August 22, 2018, aims at advising the executive board focused on the quality and efficiency of activities performed by the Company referring to the development and monitoring of its products and services.